Screening nurse from Auckland. You won’t see Vivien in the SUNDAY programme because she was indispensable in another location. 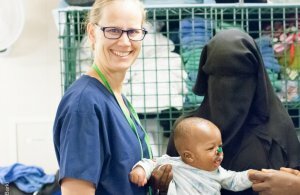 Vivien serves in one of the most challenging roles onboard the Mercy Ship – the experienced paediatric nurse works in the screening team. It is their job to triage the multiplied thousands of hopeful, desperate people seeking medical help. 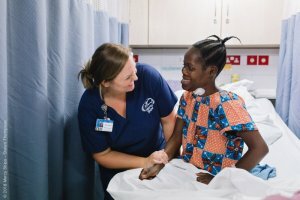 For most, Mercy Ships is their last hope. The screening team’s days are long and extremely demanding. Their professionalism, maturity and faith is taxed to the limit as they must determine if a case is considered operable. If not, the person must be told – honestly, compassionately, eye to eye and with the greatest respect, that there is no help available. But for thousands every year, the beautiful words ‘We can help you’ are life-changing. 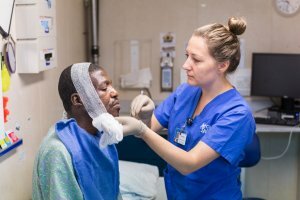 Watch here for broadcast details of the SUNDAY Mercy Ships feature, due to air early in 2019. 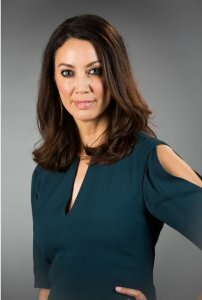 Miriama Kamo and TVNZ’s SUNDAY team present a weekly in-depth current affairs, bringing viewers award-winning investigations into the stories that matter. They are kicking off 2019 with a special filmed on board the Mercy Ship in Conakry, Guinea. 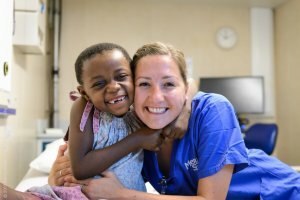 Producer Chris Cooke, reporter Tania Page and videographer Gary Hopper had the experience of a lifetime as they followed the journey of a dozen Kiwis volunteering on the Africa Mercy, and met the courageous patients receiving free essential surgery onboard. Why not receive a notification of the TVNZ free-to-air programme airdate by joining Mercy Ships NZ’s monthly EDM (you can unsubscribe at any time), and then you can plan to have a few friends over to watch along with you! When 25-year-old Mercy arrived on the Africa Mercy to be accessed by the screening team , she was in a state of depression. She looked older than her years as she spoke of the sadness and suffering that had consumed her. Orphaned as a young child, she had lost both of her own children to sickness in the last three years. 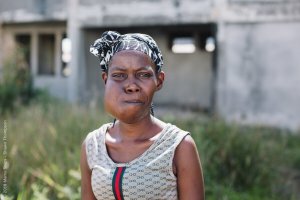 It was during this time of grief that she first noticed the lump in her mouth, which eventually grew to a large tumour. 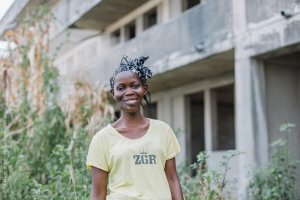 When her church in Liberia heard that Mercy Ships was coming to Guinea, they came together to raise enough funds to send Mercy to find help. The two-day trek to the port city of Conakry was long and tiring, but Mercy knew she had no other choice. Tears slowly fell down her face as she sat patiently waiting for the outcome of her screening. The past three years had seen her struggle to eat, talk, and eventually even breathe. But after a long wait, the news finally came that she was approved for surgery! She began to sing right there on the dock, filled with a joy she had forgotten how to feel! Mercy was given something she hadn’t had in a long time — hope. As she began the journey back to Liberia, she finally started to imagine what her life might be like — dreaming dreams she had not let herself imagine before. Despite still grieving the loss of her children, she now believes she has a chance to try again. 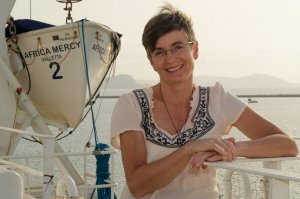 The real Esther from Mercy Ships New Zealand on Vimeo. 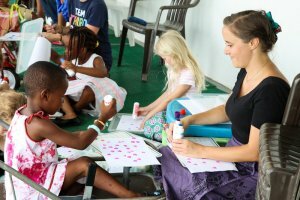 Jessica lives on the Mercy Ship with her parents. She is nine years old and she attends school on board. 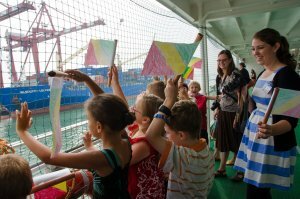 Her classmates are the children of other crew members from all over the globe. She lives with her parents in a family cabin and while they are at work Jessica attends class. There are around 50 or so kids from across the globe in the Academy, aged from months old to 18 years. 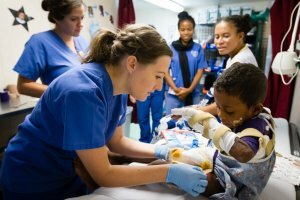 They have some pretty amazing adventures in their shipboard school Jessica’s Dad Erik works as an anaesthesia provider in the Mercy Ships operating theatres, and while she’s at school her dietitian Mum Kerry works in the Infant Feeding Programme. Jessica was born in Wellington while her South African dad was undergoing his anaesthesia training. At that time Australian-born Kerry won the Dietitians Association of NZ award. The family’s claim to fame in this instance is that Jessica is New Zealand-born, so the whole family gets invited along to the Kiwi get- togethers, including Waitangi Day and ANZAC celebrations. Where ever possible treats from home are brought along by incoming Kiwis, and the master-bakers onboard turn their hand to pav making – local ingredients permitting. 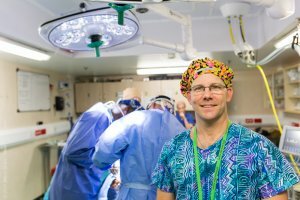 Erik Andersen, Anaesthesia Provider, in one of the Mercy Ships operating rooms. Paediatric nurse Sarah Ford loved volunteering onboard so much she turned all her goodbyes into SEE YOU LATERs! VIDEO: This mother carried a burden of shame and ridicule for 25 years, until the tumour weighed 3.5kg. But it because unbearable when her daughter developed a similar lump on her face. Valerie and Edith, a double burden from Mercy Ships New Zealand on Vimeo.